Water lies at the heart of the complex web of ecological processes that define not just the patterns of human settlement, but all plant and animal life. It is a system that sustains and defines who we are and how we live. Yet over the years, the management, distribution, and protection of water has splintered into discrete boxes, often resulting in little practical collaboration. This topical splintering of water among practitioners has put to cross-purposes a resource that requires deep collaboration and holistic management across sectors, agencies, and governments. Saint Anthony Falls in Minneapolis. Photo by Joe DeAngelis, AICP. The One Water Summit, an ongoing initiative and annual conference on the part of the US Water Alliance, seeks to change that. With the One Water Summit, the US Water Alliance actively works to bring a “one water approach,” the holistic management of water as a deeply integrated system, into the world of practice. 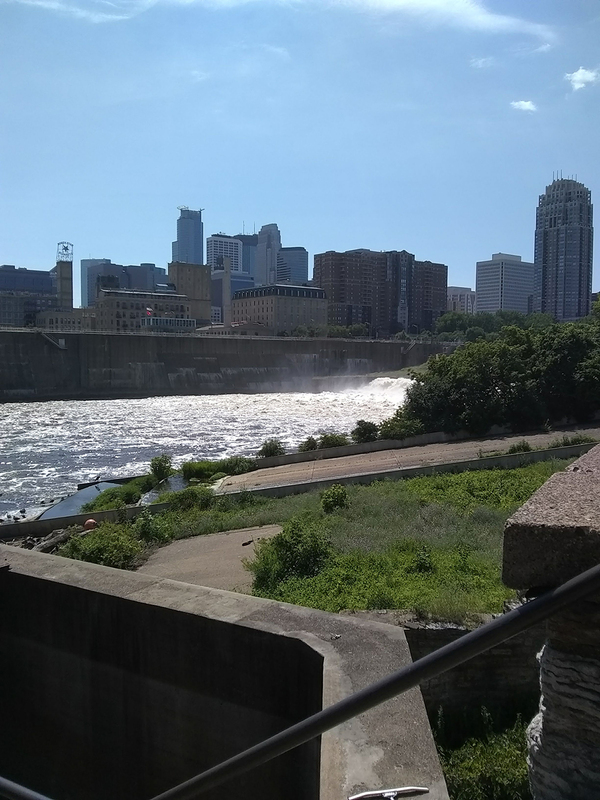 The 2018 summit, held in the Twin Cities July 10–12, brought together hundreds of water practitioners, allied professionals, researchers, and activists to talk, learn, and work on ways to solve the most pressing water-related challenges facing us today. If there is a place for a stormwater specialist to learn about how sea level rise may impact the local drainage network, or for a drought researcher to discuss the human impact of prolonged drought on tribal lands and indigenous peoples, it is at the One Water Summit. Given the diffuse ways in which water impacts communities, and the historic isolation of water management into discrete areas of practice separate from planning, planners are showing renewed interest in more deeply integrating One Water principles into their work. Aside from APA’s own delegation to this year’s summit, dozens of planners were in attendance (many as leaders of large regional delegations) to teach and be taught about how water can and should be a major priority across the spectrum of planning practice. The first day of the summit was a remarkable opportunity for these delegations to engage in deep conversations, with planning often becoming a prime discussion topic. What is the role of land use planning in water supply management? How does zoning impact a city’s vulnerability to water-related natural disasters such as drought, coastal flooding, or long-term sea level rise? As the front-line in public engagement, how should planners talk about water issues with local citizens and stakeholders? The goal of these conversations between delegates was not necessarily to come to definitive answers, but to build partnerships, think critically, and take the first steps toward more collaborative approaches. First, that planners are vital (and well-suited) to ensuring and enabling the cross-sector partnerships necessary to make more integrated water-resources management a reality. Second, and perhaps most crucially, without deeply integrating water into plans and daily practice, water will remain a discrete resource to be considered in isolation and without the One Water perspective so critical to the future of planners' communities. With these themes in mind, APA’s delegation to One Water 2018 sought to engage and educate attendees on APA’s recent and considerable efforts in advancing one water principles, and in the particular role to be played by planners in managing and protecting water. The delegation advanced the efforts of the APA Water and Planning Network, whose members have worked hard to bring water and water-related issues to the fore of planning practice. With the recent groundswell in calls for action on the part of planners, APA’s own Water and Planning Connect conference, to be held September 11–12 in Kansas City, Missouri, will be a crucial opportunity to continue this discussion. One Water 2018 was a remarkable gathering, particularly in the breadth and depth of the collaboration it enabled among those engaged in water resources management, research, and activism. Over the coming decades, planners will have the potential to play a leading role in enabling and advancing this collaboration, both locally and nationwide. Top image: The 3rd Avenue bridge in Minneapolis at night. Thinkstock photo. Joseph DeAngelis, AICP, is a research associate in APA's Hazards Planning Center.